The arrest last week of French polisher, Mr Simon C. Horn, for interfering with a client's coffee table is just the latest in a series of high profile scandals that have rocked the industry. Said Mr Horn, "I don't know what came over me, I just couldn't help myself. There was something about the heady aroma of the polish and the dusty atmosphere of the shop that I found simply intoxicating. 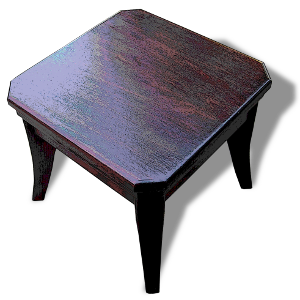 The sight of Mrs Waverley's table just sitting there, waiting for me... the lustrous sheen of the veneer, the shapely curve of its legs... I just had to have it!" A police spokesman assured the public that whilst this was just an isolated incident, they would be wise to take precautions when trusting their furniture to the care of strangers. "There's a lot of sick bastards out there," he said. "So try not to let your wardrobe go out unattended, and, if possible, ensure your sideboard is back indoors before 10pm." He latter added, strictly off the record, that he thought Mrs Waverley's coffee table was probably asking for it.